Darien Elementary School Principal Nancy Resch leads a school-wide cheer about making good choices and being drug free! On Monday, Oct. 21, Darien Elementary School students and staff kicked off Red Ribbon Week with an all-school assembly. 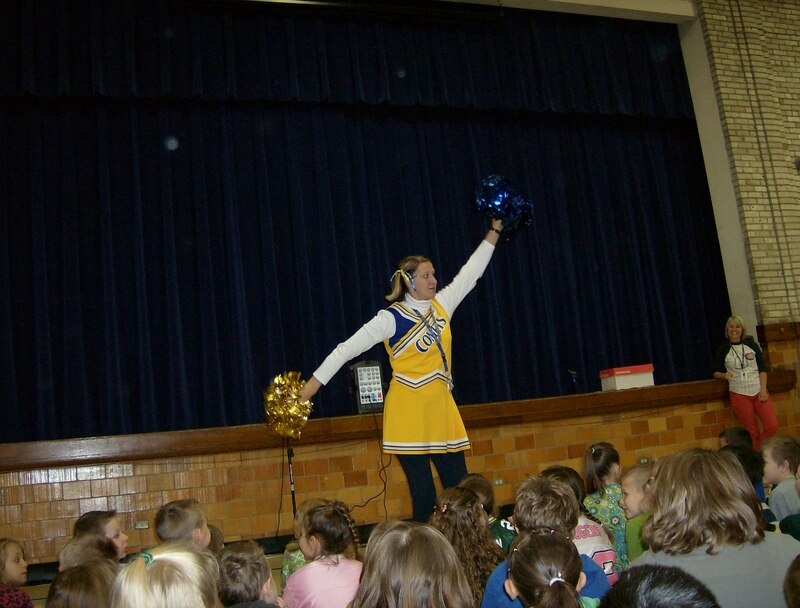 Entertainment for the morning was provided by Principal Nancy Resch, who, while donning a Comet cheerleading uniform, led the students in cheering for good choices. The assembly ended with an all-school song. Schools around the country celebrate Red Ribbon Week. It is one of the oldest and largest drug prevention programs in the nation. Although the start end dates can vary slightly depending on the organization and source, Red Ribbon Week generally takes place the last full week in October, with the weekends before and following the last full week included as appropriate celebration dates. This year Red Ribbon Week is be celebrated October 21-29, 2013. Red Ribbon Week serves as a vehicle for communities and individuals to take a stand for the hopes and dreams of our children through a commitment to drug prevention and education and a personal commitment to live drug free lives with the ultimate goal being the creation of drug free America. This entry was posted in Darien Elementary School, Delavan-Darien School District, News Releases. Bookmark the permalink.